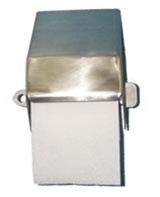 Security Accessories are designed for vandal resistance and utilize heavy gauge stainless steel to withstand abusive environments. These accessories are suited to heavy use and penal facilities. Heavy Duty Towel Bar - 18"
D-6010-18-SS Heavy Duty Towel Bar - 18"
Heavy Duty Towel Bar - 24"
D-6010-24-SS Heavy Duty Towel Bar - 24"
Heavy Duty Towel Bar - 30"
D-6010-30-SS Heavy Duty Towel Bar - 30"